New York, Viking, 2005, 337 pp. Lawrence, Massachusetts was, at the beginning of the twentieth century, what might be called one of the greatest mill towns in the United States, but "greatest" is a difficult term, and underneath it hide all the conditions that erupted during the frigid winter of 1912 into a strike that affected both the labor movement and the textile industry for decades afterward. 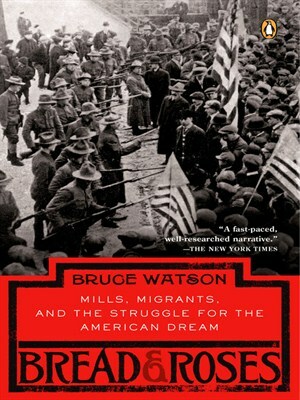 Bruce Watson's compelling and deeply researched chronicle of the strike takes its name from a poem and song that have come to be associated with Lawrence, although there is, according to Watson, no evidence that "Bread and Roses" ever appeared as a slogan in Lawrence until long after 1912. This fact might suggest that Watson's position is one of a debunker, but he offers less debunking than revitalizing, and the ultimate effect of his book is to show why the romantic notions behind the "Bread and Roses" phrase do a disservice to the courage and accomplishments of the strikers. Watson's greatest strength is his ability to weave weighty research into a narrative that is lively and seldom ponderous. There are costs to this approach, because the minutia of a strike's planning and execution are not always suspenseful, and so, as Watson strives to hold the reader's interest there are times when the sentences sound like the narration of "America's Most Wanted" and swaths of yellow from the journalism of 1912 seem to have seeped into the book's pages. This is a minor annoyance, though, in a book filled with vivid portraits of ordinary workers and their families, and with precise, careful renderings of an age and culture. Again and again, Watson brings the book back to the circumstances of the immigrant workers who started the strike, and he compares their lives to those of other workers throughout the United States, to the owners and administrators of the mills, to the politicians, to the police and the soldiers who were sometimes fierce combatants with the strikers, sometimes bewildered and beleaguered sympathizers. It would be interesting to watch a free-market ideologue respond to Bread and Roses, because again and again Watson presents damning evidence of the failures of unbridled capitalism to produce anything but misery for people who worked in the mills. He includes a budget created by one of the workers' wives; she lists such expenses as rent, kerosene, milk, bread, and meat. Watson lays out the family's other expenses, the fact that they couldn't afford to buy coal and so their only heat during the brutal winters came from the bits of wood their children could scavenge, the luxuries they couldn't buy (butter and eggs), and then comments: "Like most mill workers, the Bleskys could not afford clothes fashioned in Manhattan sweatshops from fabric made in Lawrence. ... The Bleskys each wore the same clothes until they wore out. When the strike began, Mrs. Blesky was still wearing the shawl, skirt, and shirtwaist she had bought in Poland three years earlier, just before coming to Lawrence. Ashamed of her shabby appearance, she almost never left her home." Searching through numerous archives, Watson has unearthed one story after another like this one, and each undermines the fanciful justifications and accusations made by the mill owners, which Watson also chronicles well. To his credit, though, he does not present the owners, the politicians who supported them, and the reporters who often printed even their most outrageous lies as caricatures, creatures so obsessed with profit that they would happily trod over the people who created that profit for them. Instead, he tries to divine the self-delusions and paranoid fears that motivated the workers' many antagonists. While on the surface it may seem immoral to try to portray the masters of such misery as flawed and idealistic human beings, the result is both complex and useful, because ideology was as much a part of what created the misery as was greed. The Lawrence strike became a national cause, and it attracted the attention of celebrities and rising stars of the labor movement, including Big Bill Haywood and Elizabeth Gurley Flynn of the IWW and John Golden of the AF of L. The events and tactics that brought so much attention to Lawrence are particularly fascinating, and Watson does an admirable job of showing how the strikers decided to carry out the strike and advance their cause, particularly with the controversial and immensely effective "children's exodus", where the children of strikers were sent to the homes of union members in New York, Vermont, and elsewhere. With each new day and week of the strike, more groups joined in, until the strike itself became, for a short time, a panoply of people from all around the world. 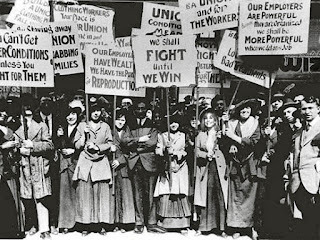 Numerous women, too, who had often been relegated to the background in labor struggles before, became vital players in Lawrence, and the book includes a marvelous photograph of a parade of women holding their hands high, joyous smiles on their faces as they march down the street, defying the martial law imposed on the city. Even as more and more strands are added to the story, the tale itself stays clear. Watson manages to show how the different segments of the labor movement both aided and undermined each other, and he doesn't smooth over the conflicts that broke out when the national interests were different from the local ones. (On the whole, though, this strike was remarkably unified compared to others both before and after it.) Haywood and Flynn in particular make for great characters in the story, but Watson skillfully keeps them from stealing the stage, always bringing the story back to the lives of the workers in Lawrence, the people who would have to live with the consequences of the strike once the nation's interest turned to other events. In the end, it is the ordinary workers who remain the most remarkable element of the Lawrence strike, as Watson tells the story, because here were people from vastly different backgrounds, experiences, religions, and even political views who found solidarity and, through this solidarity, a certain amount of success. The epilogue is not misty-eyed about the effects and consequences of the strike, but it also offers a kind of quiet hope for the future: for all the possibilities that imaginative, energetic, and compassionate mass action can create.